Imabari City, Ehime Prefecture, is Japan’s top producer of towels. 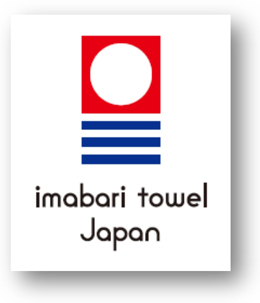 While Imabari Towel products have the popular image of being luxury, in recent years an impressive logo and an English description, “imabari towel Japan,” can often be found on the products. 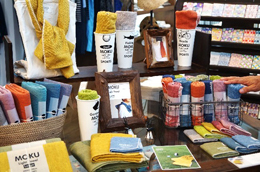 Backed with a long history of towel production, the Imabari region achieved this successful result by promoting the region-wide brand strategy to compete with low-cost towels imported from foreign countries. This time, I visited Imabari City to explore what the brand strategy looks like, how Imabari Towel products and imported ones are different, and what attracts people to the products. I interviewed Mr. Tadashi Kimura, managing director of the Shikoku Towel Industrial Association, in Imabari City. According to Mr. Kimura, Imabari once richly cultivated cotton, making the region famous for cotton textile production. Later, Imabari people learned about the towel industry, which had begun in the Senshu region of Osaka, and started towel production about 120 years ago. The Imabari region is a producer of cotton and rich in soft water, suitable for towel production. In the past, towels bleached and dyed in the manufacturing process were dried in the sun. The low-rainfall region and its warm climate were ideal for the towel industry. Thanks to a natural environment best suited to towel production, many manufacturers started business in Imabari, and the industry gradually came to represent the region. Towel production in Imabari peaked in 1991 when Japan was enjoying the bubble economy, and annual production exceeded 50,000 tons. 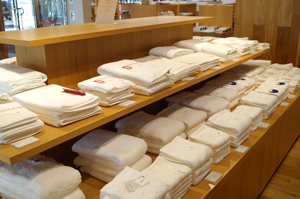 At that time, most foreign brand towels for gifts sold at department stores were made in Imabari. However, production gradually fell to one-fifth by 2006. This was due to a dramatic decrease in the demand for gifts and an increase in the number of imported low-cost products. With the drop in production, the number of association members decreased from 500 to 112 companies. Even so, Imabari City, producing more than 11,000 tons of towels each year, accounts for around 55% of domestic production today, making the city the top producer in Japan. In 2006, the Imabari Towel Project was launched with subsidy from the government-led JAPAN Brand Development Assistance Program. In this strategy, Imabari towel industry strived to address the decrease in towel production due to imported low-cost products as well as to further improve product quality and make Imabari Towel more famous to promote the branding of the production area. ”I think it was good timing and opportunity: around that time, I met a creative director, Mr. Kashiwa Sato,” says Mr. Kimura. This fateful encounter became a turning point for leading the project to a successful conclusion. Mr. Sato has been highly evaluated for his many successful branding projects, including designs for Kirin beer cans and Docomo cell phones, spatial design for Tsutaya stores, and Uniqlo’s global branding strategy. After his participation in this project, it was decided that the white towel was set as a key product and the concepts of safety, security, and quality were to be emphasized. In addition, the colors red, blue, and white were adopted for the logo to represent the sun, ocean, sky, and water that support the quality of the towels as well as to portray white towel of Imabari. Furthermore, the letter i of “imabari” was modeled in the logo to guarantee the quality of the products. In 2007, Japanese people’s concern over food safety and security was growing due to the Chinese cardboard bun hoax and poisoned dumplings incidents. At the same time, the media actively started to focus on the fact that domestic production areas exhausted from imported products were trying to regain vitality. In such a social situation, the project successfully made Imabari Towel more famous, finally resulting in an increase in the number of orders. 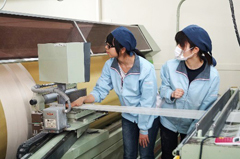 Imabari towel manufacturers actually saw positive change in the production area in three years. Next, I visited Mr. Seiji Kondo, CEO of Kontex Co. Ltd., to interview the business manager and learn about the production site. He currently serves as the president of the Shikoku Towel Industrial Association as well. ”How would you describe good towels?” At the very beginning of the interview, I asked him what I most wanted to know. ”That’s a difficult question to answer. Many people think that soft towels are good. But focusing only on making them as soft as possible can lower water absorbability, which is the most important function of towels. For example, luxury towels found in hotels are not suitable for walking exercise. When doing walking exercise, you should use thin towels with an antibacterial effect and other functions,” explains Mr. Kondo. He believes that good towels fit user’s TPO (time, place, and occasion) and lifestyle; in other words, softness is not always a primary concern. 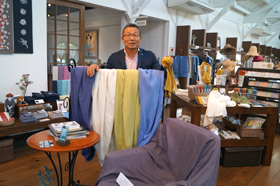 In response to a question about the features of Imabari Towel, Mr. Kondo gave an unexpected answer: “The feature is that we are seriously committed to making towels.” According to him, today the manufacturing process in the towel industry is divided, and it is important for all relevant manufacturers to do their jobs perfectly in each process. That is to say, relevant manufacturers fully comply with the strict standards established to ensure quality products. 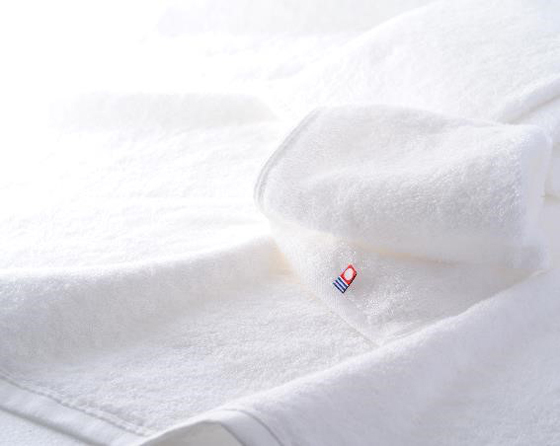 Among the standards, water absorbability and human safety are particularly taken into consideration as the key features of Imabari Towel. I asked Mr. Kondo about his spirit of commitment as a business manager. 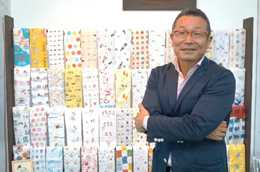 His answer was “towels that are different from others.” In other words, the strategy is to produce original products that are not sold by other companies and avoid pursing only sales volume, so that Kontex towel can break free from being “one of them.” To do so, Kontex towel products are mainly sold at towel stores that fully understand the nature of Imabari Towel. The Kontex factory has state-of-the-art high-speed weaving machines, while also possessing an old weaving machine manufactured by Toyota Industries Corporation that is still used for non-mass production. One day, when they received an order from a repeat client in Seattle, the old weaving machine was out of order, so the order was produced with a new weaving machine and shipped to the client to meet the delivery requirements. Later, however, the client made a complaint: “These are not what we wanted. You didn’t use that machine to produce the towels, did you?” There are a certain number of fans who love towels produced with “that machine,” whose quality is hardly discernible to the eye. Kontex values such fans. Mr. Kondo says, “We got all of the towels back from the client and sent new ones that were produced with the repaired old machine.” This story demonstrates the company’s strong commitment to service for its clients. He sees today’s towel industry as being closer to the fashion industry: 10 out of 110 Kontex employees are currently in charge of planning products. Exploring the lifestyle of modern people, they select yarns that fit the lifestyle and change the methods of weaving. Kontex also organizes and manages collaborative campaigns with the apparel, sports, and furniture industries. Mr. Kondo stresses that planning is more important than anything else to produce unique products that suit various usage scenes. While explaining, Mr. Kondo showed us the Towel Garden, a shop converted from an old factory in the image of Manchester in the UK, the home of woven fabrics. There were a rich variety of products in the shop that are beyond the traditional image of towels. In addition to planning and designing products, Kontex also carries out the warping process to create huge bobbins before the yarns to be used are set on the weaving machine, and then performs the weaving process. After bleaching and dying processes are done by professional manufacturers, the returned huge towel cloth is cut and sewn. Then, finished products are packed in a box for shipping to clients. 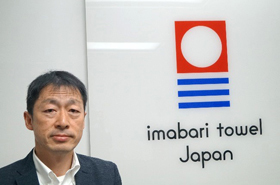 ”I think that the greatest benefit of having achieved the successful branding of Imabari Towel is to attract young generations to our industry,” says Mr. Kondo. I asked him to let me tour the Kontex factory. 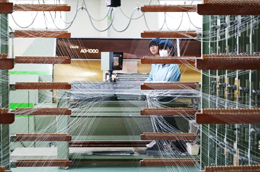 In the warping process, which is considered another important process to determine the quality of products, I found two young women working in the factory. One was in her fifth year at the company, and the other was a new employee. In the process of creating huge bobbins by collecting yarns from many rolls, workers are required to manage the subtle tension adjustment of yarns. According to Mr. Kondo, women are good at such delicate work. Through these interviews, I found several advantages of Imabari Towel: ensuring a certain level of high quality through the region’s full commitment to the quality standards, striving to improve the quality of products by each manufacturer with a strong commitment, and attracting prospective workers to the popular and reliable Imabari brand. ”I see infinite possibilities in two warps and one woof that turn into towels,” says Mr. Kondo. These words made me feel his strong confidence in developing Imabari Towel even further. 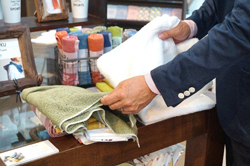 As one of the initiatives under the Imabari Towel Project, the Towel Sommelier Certification System was established. The purpose of this system is to develop professionals who can provide proper advice about the towels that are best suited to individual customers. I came by the official Imabari Towel shop, where Ms. Akari Sakurai, a towel sommelier, offered me her recommended bath towels. As you might guess, I left the shop with some white Imabari towels. Copyright © 2019 IHCSA. All Rights Reserved.